Home � Disney World News , Disney World Running Event , Disney World Vacations , Half Marathon , runDisney , Walt Disney World Marathon Weekend � Disney World Half Marathon is CANCELLED due to threat of Lightning! Disney World Half Marathon is CANCELLED due to threat of Lightning! The Walt Disney World Half Marathon scheduled for tomorrow (Saturday January 7, 2017) has been CANCELLED! In a move to protect Disney runner's safety they have cancelled the Disney World Half Marathon entirely due to the threat of lightning during the race which usually is host to well over 25,000 runners. This is a major disappointment for the thousands of runners that traveled to Florida from all over the world to participate in the historic 20th running of the Disney World Half Marathon. 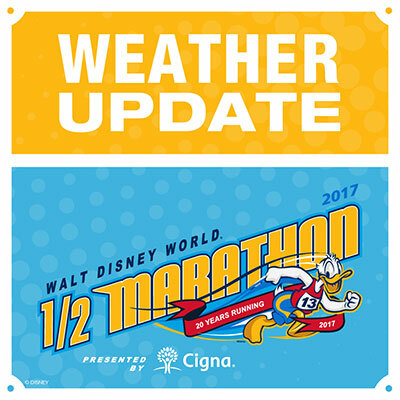 In an abundance of caution, the Walt Disney World Resort has cancelled all running events on Saturday, Jan. 7, 2017 due to weather conditions. This includes the Walt Disney World Half Marathon and the Disney Kids Races. In addition, the runDisney Health & Fitness Expo will delay opening until 11 a.m. While we share our Guests’ obvious disappointment, the safety of our Guests and Cast is most important. Weather tracking has indicated there is an elevated risk of lightning in the area of the racecourse. In addition, there are sections of the course that do not provide immediate access to shelter. Both of these factors have influenced this difficult decision. A full refund for their race registration in the form of a Disney gift card. Two One-Day Park Hopper tickets. Defer registration to another runDisney half marathon race in the U.S. within the next 24 months, subject to availability. We can offer limited availability to run the full marathon on Sunday, Jan. 8, 2017 during the regularly scheduled race. All registered runDisney Kids Race runners will receive their Kids Race medal and a full race registration in the form of a Disney gift card. 0 comments to "Disney World Half Marathon is CANCELLED due to threat of Lightning!"